Research has shown that incline running on our unique, hydraulically controlled Super Running Treadmill provides 200-300% more recruitment of the muscles responsible for increasing and maintaining speed, than running on level ground at the same stride frequency. This type of speed training increases the chance for baseball/softball athletes to beat out the infield hit, run bases faster or get to the ball quicker. 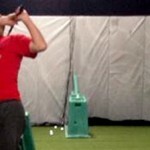 We will also work on proper running mechanics from arm swing, foot strike and knee drive.